Book 3 of the Cassandra Palmer series. The spell that binds them can only be broken with an incantation found in the Codex Merlini, an ancient grimoire. The Codex’s location has been lost in the present day, so Cassie will have to seek it out in the only place it can still be found—the past. 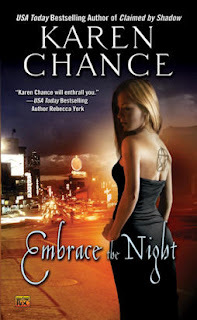 Source: Info in the About This Book was taken from the author's website at http://www.karenchance.com/books_embracethenight.html on 25/10/09. This book has adult content. Verdict: Fast-paced and never a dull moment. The story-telling quality is good although it has some annoying tendencies like trying to paint the female protagonist as stupid in an effort to create more drama in the story. I find that irritating to read. There is also too many time travels back and forth, back and forth, which is kinda dizzying to the reader. Having said that, the author has cleverly avoided paradoxes which is the usual pitfall of time tavel stories. This book is also fast-paced and never a boring moment. On the whole I would give this book a 3 and a half out of five.